It’s been a while since my last post, but I haven’t been experimenting too often in the kitchen. One of my favourite TV shows is Masterchef, and in particular the Australian edition. It’s absolutely inspiring and great for recipe and plating ideas. The combination of Pinterest and all the Masterchef ideas running through my head results in this: perfectly cooked chicken in a spicy, tangy glaze, silky smooth puree and crunchy asparagus; a burst of flavours and textures on one plate. 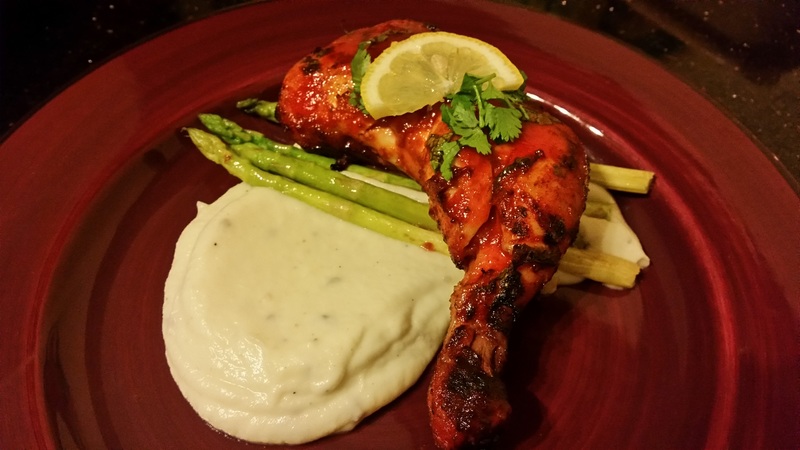 The cauliflower puree balances the spicy Sriracha sauce well. Sriracha sauce originated in Thailand and the most commonly used/ available brand is the one produced by Huy Fong Foods. The sauce isn’t available readily in Sri Lanka unfortunately, so I had to get it down from Malaysia. It is suuuuper hot, but deliciously so, if that’s even possible! 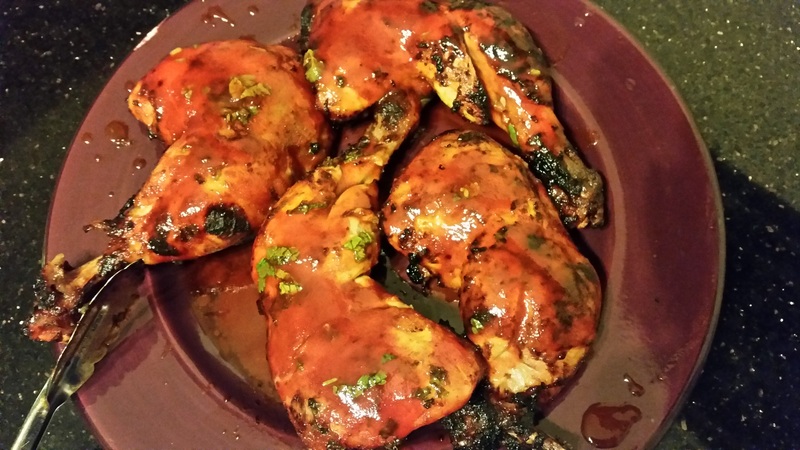 I used chicken thigh+ leg quarters and marinated the chicken for 2 hours, intensifying the flavour. The glaze is an adaptation of a recipe I found on Pinterest from Better Homes & Garden magazine. Aside from 1 tablespoon each of Sriracha sauce and honey, add all the remaining ingredients into a zip-lock bag and mix well. Place in the refrigerator for 2 hours (min. 30 minutes). Grill the chicken on both sides until done; about 30-35 minutes, on medium heat. I used an air fryer (an absolutely handy appliance) and it took about 15-20 minutes. 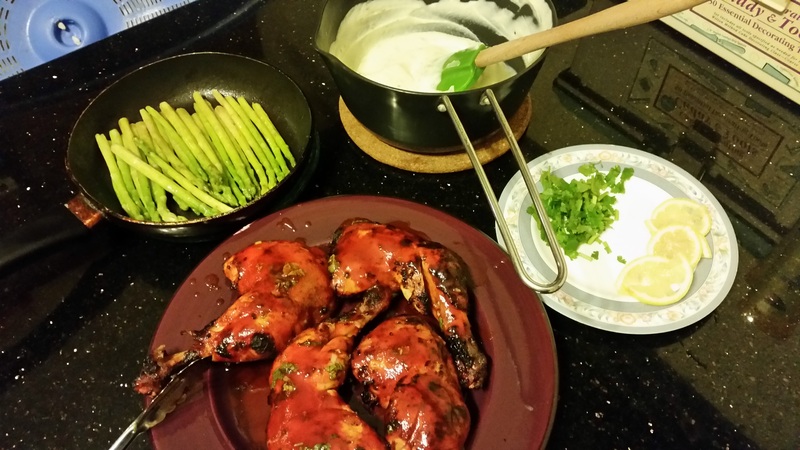 I glazed the chicken with the reserved sauce and honey halfway through and once the chicken was done. The chicken was sticky and spicy and delightfully delicious. I used an actual Masterchef Australia recipe for the puree and it was perfect. To make the puree, bring a large saucepan of water to boil and cook the cauliflower, until tender (about 20 minutes). Drain and place in a blender. Add the cream and butter and whiz until smooth. Season with salt & pepper. I added a tablespoon of dried herbs to elevate the flavour. Mix well and set aside. Poach 200 grams of asparagus (trimmed) in a pan, with a small knob of butter. The asparagus should still be crunchy. Smear a generous quantity of puree across the plate. Place a serving of chicken across the end of the smear, with several asparagus draped on top diagonally. Garnish with a slice of lemon and some coriander. Voila! With a little bit of prep ahead (for the chicken marinade), making this meal will be a breeze. While the chicken is grilling, you can get the other elements done in time and then you’re good to go. Masterchef style dishes don’t have to be limited to watching it on a screen; it’s easy enough to try yourself. You just need to be adventurous!